The above headline would be my suggested title for this week's The Walking Dead. The writers went with “The Key,” and said key is delivered to Maggie and the Hilltop by an affable lady named Georgie and her oddball companions Hilda and Midge, all of whom tool around in an apocalyptic version of the Mystery Machine. Only not as colorful. Georgie—played by House of Cards' Jayne Atkinson—kind of looks like Glenn Close dressed up as Gregory (Xander Berkley) for Halloween, right down to her button-up and blazer. She’s a hell of a lot nicer, though, and certainly more hopeful. All she wants in exchange for a bunch of food and the key to hope is a crate full of something she can dance to. Record albums. Music. No spoken-word. But more about that later. Tara jeopardizes the Alexandrians, Maggie makes choices, Negan has a plan. We start the hour with a grinning Negan putting his Deadly Zombie Germs plan into action, instructing his soldiers to coat their weapons with walker guts and then harvest buckets of extra to refuel if need be. He also welcomes Dwight back into the fold with a sixer of homemade beer and some equally potent suspicion. Maybe it’s me, but Dwight could not look guiltier if he tried. Negan tells him to prep for the new plan, anyway. Meantime, Simon’s doing as he’s told, but making barely veiled “I hate you so hard” faces at Negan when the boss isn't looking. “Just flesh wounds,” Simon tells the underlings. “Hit a few, leave ’em living, let ’em turn. Don’t kill ’em.” At least until a little more “I kind of killed 99.9 percent of the Heapsters against Negan’s wishes” water is safely under the bridge. The AMC series is also getting a new showrunner. I’m mystified by this situation. Yes, I know that germ warfare is part of Kirkman’s comics. But in the TV universe, the living — even little bitty ones — have been coating themselves walker muck since Season 1 and, near as I can tell, nobody’s gotten sick from doing it. I get that Negan thinks he’s onto something because he only got mucked up with Gabriel and look what a mess our Father is now. But is there really something to this plan? Did the freshness of the earliest zombies render them less potent? Or are we about to learn that Negan’s not as smart as he thinks? And Dwight's about to use that to his advantage? In any case, Negan decides to drive himself to the germ party, presenting Simon with a fine opportunity to try to talk some mutiny into Dwight. Or as he puts it, “Rap. Get candid. Get weird.” Dwight looks at him like he’s doing a fine job of that last one, especially when Simon points out that Maggie, Rick and Ezekiel don't scare, so maybe they need to dispense with the warnings in favor of some permanent damage. At Hilltop, Rick and Michonne make their entrance. Rick eyeballs the Savior captives, then reunites with Judith. A bit later, Daryl finds him having some me time among the graves and takes a stab at meaningful discussion. Daryl thinks about the unfairness of death, especially in terms of who’s still living and who remains a waste of breath. Then he apologizes for what went down at the Sanctuary, a.k.a. the second time he effed up and got some mega players killed. Here’s where he loses me. He admits he just wanted the crap with Negan and the Saviors done. He "didn’t care who was there" when he did it. He doesn’t know if that makes it right, or … why the hell would that make it right, Daryl? Yeah, you made a fine mess of the Sanctuary, but you also kyboshed most of Alexandria, got half the Kingdomers killed and set the Saviors on some kind of revenge mission. Plus, no one was home to keep an eye on Carl. OK, that last one isn’t really his fault. But it would have been nice to mourn the boy at home. How closely will the series stick to its comic-book source in killing off beloved characters? Tell him, Rick. Tell him that. Rick tells him that ... of course it makes it right. Huh? Rewind, rewind, rewind. Yes, he just said Daryl was right. Then Rick lowers his eyes extra drunky-like and says he, himself, never wanted to hurt innocent people, but what he should have been focused on was protecting his own people. Good talk. Back to the fight, shall we? Maggie’s got lookouts stationed every half mile or so between Hilltop and Negan to keep an eye out for their approach. Daryl volunteers to buddy up with Rick to bolster the ranks, but Rick says they’re better off apart. Daryl looks like it might be the precursor to a stealth breakup, but Rick backs it up by thanking him for getting everyone safely to Hilltop. 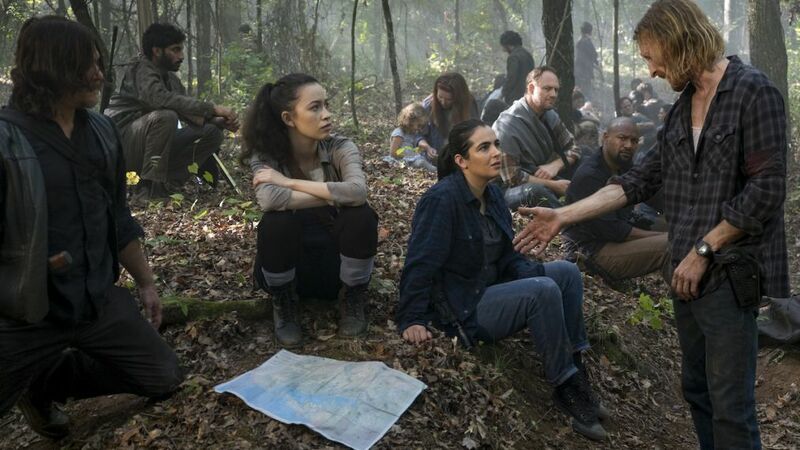 Maggie and Rosita, meanwhile, keep tabs on the homestead and talk about whether Rick will ever “come back” from Carl’s death. Rosie points out that they all soldier on, but their losses will seem harder once the fight is over and there is nowhere but grief for their minds to go. In the meantime—shiny thing in the clearing! It’s Georgie’s empty record crate and request for tunes and appetizers. Maggie and Michonne disagree about what to do next. Michonne thinks whomever wrote the note sound like very nice people on whom Hilltop should take a chance. Maggie says if they’re wrong about that they’re dead. Fine, says Michonne, she’ll go investigate all by herself. Rick won’t like it, but sometimes a girl’s gotta do what a girl’s gotta a do. Especially when her boy’s been wrong so frickin’ many times. Her boy, meanwhile, spots the Savior caravan, Negan acting as caboose. Instead of sounding a warning, he leaps behind the wheel—and it’s The Fast and the Furious: TWD! Rick T-bones Negan, who leads him on a mighty chase, complete with closeups of their determined faces. But Rick’s not the only one who spies an opportunity to rid himself of Negan. Realizing what is going down, Simon seizes the chance to flip the day's script. He tells the other Saviors to sit tight while he and Dwight go look for the boss, but if anybody approaches, shoot first and never mind with questions. Negan, meanwhile, rolled his car at some point in the chase and is now lying in its wreckage, covered in walker muck. The situation inspires Rick to go right out there and prove he is the worst aim ever. For many, many minutes in a row. First, he grabs an automatic rifle and, before he can even spot his target, starts firing bullets like he’s got 300 Eugenes making him more. Fine plan, Rick. So is lowering your weapon while Negan runs 20 yards in the wide-open to reach the nearest building, and then resuming shooting. And then ditching the automatic rifle before you head into an abandoned building where God knows what awaits. Though 'The Walking Dead' fans are angry, could Carl's death refresh the series? We look at both sides. Negan (and Lucille) await just inside the door, but Negan has lousy aim today, too. He scrambles up a flight of stairs as Rick draws his pistol and resumes firing away at nothing until he runs out of bullets in that thing, too. He’s got an ax, though, which he throws at Negan’s head and splits it neatly in half. Just kidding. He misses, but Negan helps him out by cartwheeling inexplicably through a railing, dangling by his fingertips and sending Lucille plummeting. Rick grabs the bat … nope … Rick runs up the stairs and puts his retrieved ax through Negan’s skull … nope … Rick runs up the stairs and takes a mighty chop at Negan’s fingers, who lets go, because why ruin Rick's crappy average now? Turns out Maggie, Rosita and Enid all decided to accompany Michonne to the assigned meeting point, where the Mystery Machine awaits. And here’s Georgie. I instantly like her better than everyone else on the show combined (except for Simon because I cannot help it). Georgie likes that the Hilltop ladies are unafraid; she only shares with the strong. And unlike the supply-grubbing Saviors, she deals in knowledge, which is in her head and that’s where it’s staying for now. Georgie thinks the Hilltop is exceptional and she's sure it can be a big part of righting the universal ship, once people start believing in people again. Once they resume trusting. Yes, she knows trust sounds like a made-up word right now …. Like flibbershticky or klumpf (Hilda’s contribution) or moisture (Midge isn’t the sharpest knife in the drawer). Enid calls B.S. on the proceedings, but Georgie isn’t fazed by her bad manners. Maggie says the rest will be resolved back at Hilltop. The AMC hit returns this April. Meanwhile, a perfectly fine Negan is feeling surprising benevolent himself, considering that he just got t-boned, shot at, nearly axed and assorted other indignities. He repeats his shtick about being good at saving those who agree to be saved. Keeping kids alive. Everyone was doing just fine—until Rick showed up. But, pshaw!, he ain’t that mad. Here’s a one-time deal in memory of badass Carl: Rick knocks it off right now, tells AHK to do the same, personally agrees to be Negan’s full-time janitor and everyone can go back to the business of living. Hell, he’ll even cut his take to 25-percent. Rick wonders aloud why he should trust that, especially after what happened to the Heapsters. (Oh oh, Simon! Oh oh!) And by the way, even though plenty of Negan’s folks had to have seen Negan’s car get nailed, where are they right now, mister? Rick knows where Lucille is— right there in his mitts. Somewhere in the neighborhood, Simon wants to tread the point about killing Negan, killing everyone, finding some more cooperative folk who don't need killing, with poor Dwight. Dwight says that, despite everything, he's never thought once about killing Negan. Simon changes his tack. Way to be a grown-up, he says. To not focus on past discomforts (I’m pretty sure “past discomforts” is about to be a thing). How unlike Negan ... whose mangled car they’ve just happened upon. Simon’s take on the situation? “Just because he walked away, doesn’t mean he’s breathin’.” Why bother to chase a corpse or a walker when they can make history, starting right this very minute? Tell their grandkids that they were the architects of a whole new world. Dwight doesn’t say much; just flicks his cig into the oily wreckage. There’s your smoke signal, Daryl, no matter what Simon thinks it really means. Back at Hilltop, Georgie, Midge and Hilda are killing time on a bench while Jerry updates Maggie on the Saviors’ movements. Not much now, but nightfall is coming, and yes, he knows what happens next. Michonne says they need to get Georgie on her way before whatever that is happens, but Maggie says no. The strangers have too much stuff in that van to just roll away with all of it. The debate is interrupted by Enid having a fit. Take their stuff. Use it. Stop pretending things just work out. Jesus (not the Paul Rovia one), Enid! Did Carl write you a Dear Enid letter instead of the usual "honor me with peace" deal? Michonne uses her mommy voice to remind Enid that, yes, Carl died while being kind, but he also left them with a doctor and a friend. He was brave. And now he’s dead, Enid says, her teary eyes flashing. Michonne isn't having it. Run along, child; time for the grownups to talk. Maggie repeats that things don’t just work out and Michonne agrees. Even Carl knew that. But he still worked toward being the man Rick wanted him to be—and now they need to pay it forward. Work that out, instead. Rick, meanwhile, is still preaching to Negan. Negan doesn’t save. Negan doesn’t care. He uses. He loves himself and Lucille, finito. Given that, Rick will let him kiss the latter goodbye... because why waste another opportunity to turn a weapon, and the advantage, back over to Negan? Negan howls as Rick sets the bat on fire and then uses it to smash open a pen full of “Eaters.” Negan tackles him, but Rick recovers Lucille, gives Negan a good shot to the arm … aaaand then loses the bat back to him, because of course he does. Maggie's day of reckoning continues. She hands over a box of record albums—music, no spoken word —and will fill the other three crates, too. But then Georgie's going to have skedaddle, because trouble awaits. Georgie changes the terms of the agreement. The records—and good faith—are plenty. Not only that, Hilltop can have a “sizable portion” of her food supply. That's not a gift; it's a barter. Georgie will be back, and in the meantime, homework! And a text book, to boot! She hands over a thick binder filled with all the ways humans have moved themselves forward since Medieval times: Plans for windmills, water mills, silos, aqueducts, how to refine grain and lumber. It's time to build a future from the lessons of the past. So, get busy now and when Georgie comes back, she'll collect on the other items. Which should include cheeses for Hilda and pickles for Midge. I deeply need a t-shirt that says "Cheeses for Hilda and Pickles for Midge." I need it. 'Pay the woman,' said the actor, who plays Ezekiel on AMC's hit. I am also highly entertained when Michonne and Enid watch the newcomers roll away from atop a big yellow bus. Schooled! Or maybe not. Enid fesses up to Michonne about Natania. She killed someone and stayed alive, but Carl helped someone and he’s dead, so nyah. Well, Carl kind of helped a lot of other people, too, before getting dead, Enid, but rave on, sister. It's your job today. Are they just supposed to stop fighting, she bellows, and Michonne uses her mom voice to explain that Carl would want them to fight on ... but for future. That will take more than just fighting. They have to work toward something after. Simon's working on his something after, too. Returning to the others, he tells them that he and Dwight looked hard, but Negan is gone. Only a wrecked car and a whole lotta blood to be found. But no matter, for they all are Negan! The kind of Negan that would annihilate-and-other-fancy-death-words their enemies in the name of .... themselves! Except that Negan isn't dead at all. He comes to in a moving car, a gun held tight to his temple. It isn't Rick. It's Jadis. And she's not taking chances this time. She tells him to hush and knocks him out cold. So many things, Walking Dead fans. Is germ warfare still in play—both Negan and Rick took shots from the fouled Lucille—or was it just the slippery guts to slide us into this next peace-or-plunder chapter? Could Georgie figuratively crossing the Delaware river of progress—especially now—be the start of a new American Revolution? And does she have the pink slip to the helicopter in addition to the Mystery Machine? A flyover would certainly explain how she knows so much about Hilltop. Are the Saviors really that inclined to turn en masse on Negan and do what Simon says—especially with no body in the ground? Is Daryl going to follow the rules now? And where is Jadis taking Negan? He's a fine bargaining chip—but with whom? In the fight against wage inequality, these women are standing up for themselves.